Helen Cherry was an excellent endurance runner from the late 1950’s and early 1960’s who was never properly recognised after she stopped competing. Winner of medals in British as well as Scottish championships and cross-country internationalist and medallist she and her Edinburgh counterpart Barbara Tait dominated the Mile in Scottish women’s athletics from the late 50’s to mid 60’s. 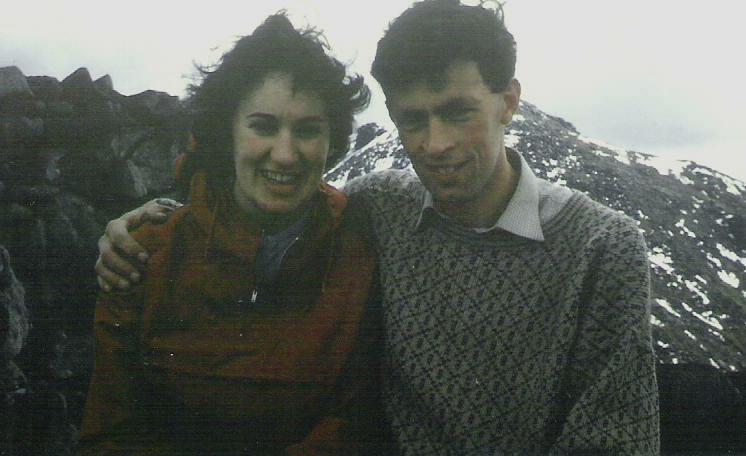 Unfortunately Helen retired at the relatively early age of 23 when she married Ian Donald who was himself a very talented athlete from Shettleston Harriers. She went to all the cross-country races and always turned up at road races or hill running events where she was competing. They were a very popular couple on all circuits. Helen was a pupil at Bellahouston Academy when she was taken along to Bellahouston Harriers track at Stanalane in Glasgow by her school friend Mary Symon and tried various events over the summer. Her introduction to middle distance running came when Dale Greig, who was a member of the club at the time invited her to run with her from the Pollokshaws Baths. This was the start to Helen’s endurance career but she was always a versatile athlete as we will see later. 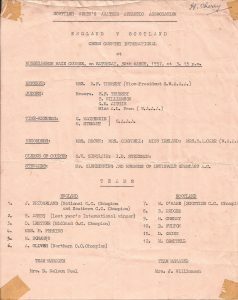 There was no sign of her in any of the SWAAA or SWCCU championships in 1956 – unless you looked at the Intermediate 100 yards and long jump where the 16 year old Helen was entered. At that point the excellent young Barbara Tait and the slightly older Aileen Drummond of Maryhill were winning all the Mile races and picking up the medals over the country. In the West trials, Aileen won the Mile and the 880 yards, in the East Barbara Tait won; in the Inter-area Drummond won the Mile and in the SWAAA Championships Tait won from Drummond. Between 1959 and 1963 the three women dominated the Mile in Scottish women’s athletics. Helen first appeared competitively in the winter ’56-’57 cross-country season. Came the day of the international and the result was unfortunately a clean sweep for England with the first six places going south of the border. The Scottish positions were – 7th D Fulton (13:10), 8th M O’Hare (13:26), 9th B Rodger , 10th H Cherry (13:41), 11th D Greig (14:02, 12th M Campbell (14:15). 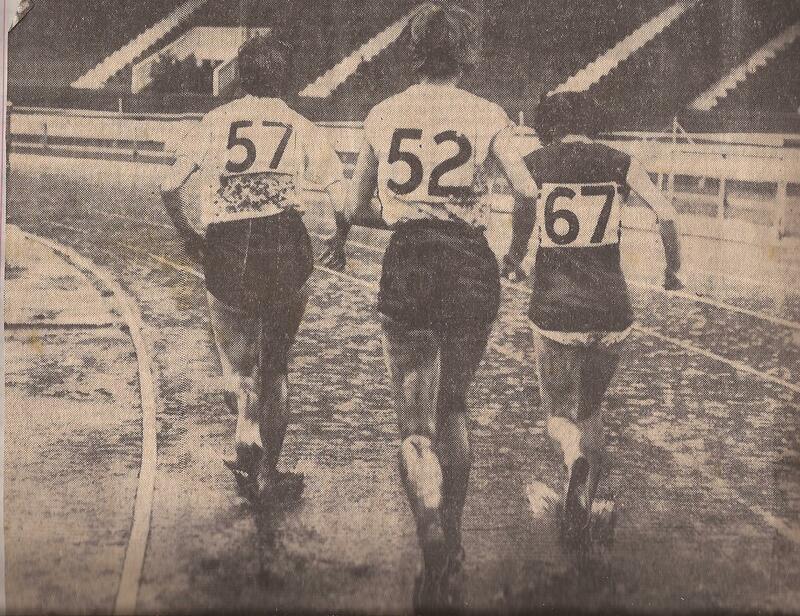 Then it was into the summer season and the first notable fixture was on 4th May at Scotstoun in the West District trials where 17 year old Helen won the Mile in 5:54. Exactly a week later in the East v West fixture she was second behind Barbara Tait of the East. Less than a month later, on 8th June at Pitreavie, in the SWAAA Championships Helen was again second to Barbara Tait over the Mile – Barbara’s time was 5:18.3. Unfortunately many of the popular Highland Games of the time (eg Gourock and Strathallan) only had two events for women – the 100 yards and the 220 yards, so there was not a lot happening on that front and the poor reporting of women’s athletics in the Press did nothing to alter that situation. Two examples – in most women’s inter-club or local fixtures, only the first across the line was given and even in the SWAAA Championships when the first four were recorded only the winning time was noted. When the men travelled to the AAA’s Championships their places and performances were were all given on the Monday and in most years the entire event was reported on – for women only the notable performances were commented on. 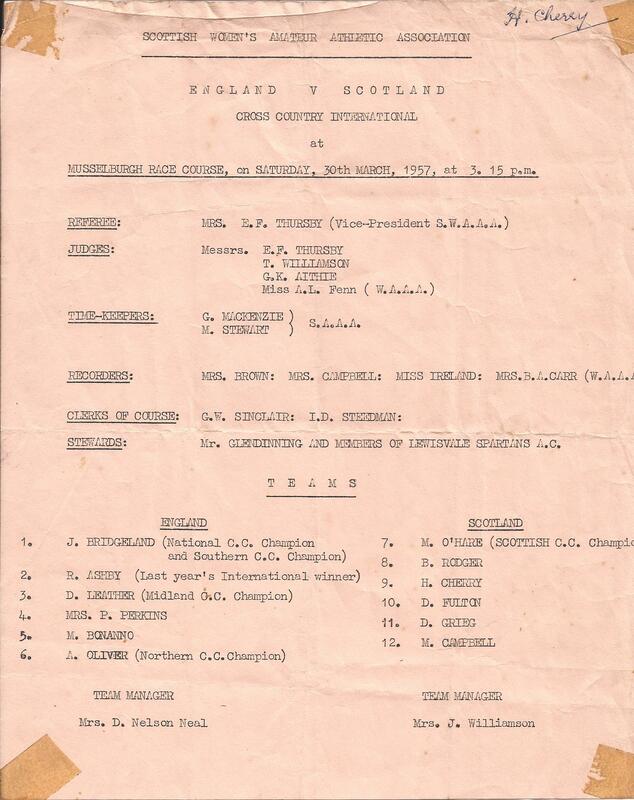 After listing the six or eight who were travelling to the fixture, the single or even double paragraph report, would maybe only comment on doubles by English women or mention a Scots woman who had won a medal. Hardly even handed reporting. The first race of any consequence in the summer was the West Trials for the match against the East and Helen was in action twice. Second in the 880 yards to Isobel Mooney she won the Mile in 5:45 from Dale Greig. A week later the headline in the Glasgow Herald was ‘West Win At Jordanhill.’ Helen and Dale had done their bit by being first and second in the Mile with Helen eleven seconds faster than the week before. The lack of races must have been frustrating for the middle distance runners – individual university championships, inter university championships and even the Scottish University championships only had races up to440 yards, and in one case up to220 yards. The highland gatherings and local sports meetings were also sparing in their races at longer distances – there were women’s 880 yards handicap events at Ardeer, Strathallan and a few more but they were the exceptions rather than the rule. Came the SWAAA Championships and Helen was in the Mile where she finished behind Barbara Tait (5:33.2) and in front of Dale Greig. It was reported in the Glasgow Herald as follows: The highlight of the Scottish Women’s Championships at Meadowbank on Saturday was the mile event when Barbara Tait (Edinburgh Harriers) regained her title with a fine tactical race. Lying second to Helen Cherry (Bellahouston Harriers) for three laps, she put in a sprint, 15 yards to go, forged ahead and broke the tape two yards in front of the Bellahouston girl.” Later in the year in the Round The Bridges Race at Musselburgh it was a different story. “The women’s one and a quarter miles race was well supported. Miss H Cherry, the Bellahouston Harriers club champion, led from the start and won in a satisfactory time of 6:08. Miss B Tait, the Scottish Mile Champion, and Miss D Greig, the Scottish cross-country champion were second and fourth.” And that seemed to be it for the summer season. Summer 1959 would be a good one for Helen although she did not feature in the National Cross-Country Championships of 1959. On 16th May in the West District Championships, Helen Cherry was first in the Mile in 5:35.3 with Dale Greig in second. 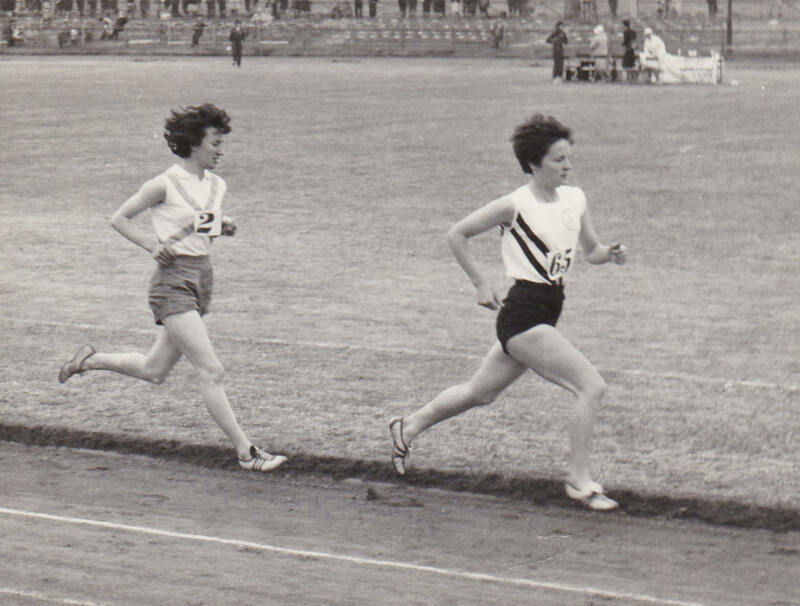 Unfortunately in the East v West the Herald headline read, ‘Comfortable Win By East Women.’ Helen was led in by Barbara Tait in 5:21.0 – a new native record that beat her own time in the East Championships by 3.6 seconds. The result was similar in the SWAAA Championships on 13th June where the Mile was won by Barbara in 5:18.3 with Helen second and Dale third. 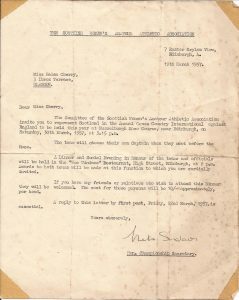 The report said that Barbara was going to compete in the WAAA Championships in England but the report of that meeting in the Glasgow Herald gave only the winners and their performances. Nowadays they might do that but then add in the Scottish athletes with a note of their performances. By the end of season 1959, Helen was ranked second in both 880 yards and Mile with times of 2:22.2 and 5:24.7. Not in the first three at the National Cross-Country Championships in 1960, Helen started the summer with a victory in the Mile at the West District Championships at Scotstoun on 6th May with a time of 5:46.7 over R O’Hare of Maryhill. This was the fourth successive year that she had won this event. She missed the West v East match on 21st May and was not placed in the SWAAA Championships. At the end of summer 1960 she was number three in Scotland but with a time 24 seconds slower than 1959 – 5:48.7. 1961 seemed to represent a switch for Helen in that after a winter with no cross-country races reported, she targeted the shorter, faster 880 yards. 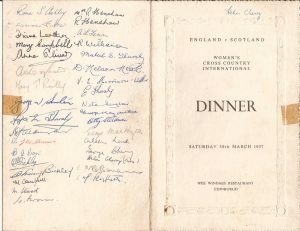 On 6th May in the West District Championships the Glasgow Herald report read, “Miss H Cherry (Bellahouston) succeeded Miss Reilly as holder of the half-mile title with a time of 2:26.2, almost four seconds faster than last year’s winning time.” Helen did not run in the Mile which was won by Dale Greig in 5:46.4. Into the East v West Match on 20th May where she won the 880 yards in 2:26.7 and was also a member of the winning Mile Medley Relay team of H Cherry, M Carmichael, M Brown and I Bond who ran in that order. Helen also turned out in the Renfrewshire Championships which she won in 2:22.4. In the SWAAA Championships on 10th June, Helen won the 880 yards in 2:22.1 from S Lofts (Anglo Scottish Club) and Pam Brown who had already won the 440 yards and Doreen Fulton who had won the Mile also competed in the half mile . “Both Fulton and Brown tried later for victory in the half-mile – but neither could match the devastating running of 24 year old Helen Cherry of Bellahouston. Helen finished like a sprinter in 2:22.1 well ahead of her nearest rival, Sheila Lofts. Pat Brown had to be satisfied with third place. Helen, who is an accounting machine operator ran in the half-mile because she was fed up taking second place in the mile for three years in succession to Barbara Tait. The change was worth while.” Apart from getting her age wrong, the irony in the report is that this time round, Barbara Tait was third in the mile. Her versatility was also mentioned earlier and on 1st July she travelled all the way to Kinlochleven Highland Games where she had entered 100y, 220y, 880y, mile, high jump and long jump! She only managed to compete in three – she won the 880 yards and the mile and was second in the long jump. To complete the day, Ian Donald won the Mamore Hill Race. In the annual rankings at the end of the summer, Helen was third in the 880 yards with a season’s best of 2:19.5. Ahead of her were two Anglos – Sheena Lofts of Aldershot (2:17.7) and Margaret Easson of Birchfield who led with 2:17.2. In summer 1962 Helen started off as she meant to continue with a second victory in the West District 880 yards when she recorded 2:26.5 and then missed the West v East. Helen won the Mile in the SWAAA Championships at Pitreavie after finishing second in the 880 yards. The mile was won in a native record of 5:08.4 which was 9.9 seconds faster than the previous time set by Barbara Tait four years earlier. She just took the bull by the horns and ran away from the field with laps of 71.5 seconds, 2:30, 3:49.1 and a finishing time of 5:08.4. The report simply said, “Miss H Cherry misjudged her running in the half-mile and gained only second place to Miss S Lofts (Anglo-Scottish), who is 19, but she comfortably won the mile. Miss B Tait, the record holder, was outpaced and finished fifth.” Coverage of women’s athletics is a source of constant annoyance to me! In the 50’s there was hardly any serious coverage in the National dailies and what there was in the 60’s was incredibly biased against the distance runners. The jumpers and sprinters were likely to get several column inches at a time, more often than not with a picture attached, while the longer distances were covered with a comment. Look at the sentences above – Helen had only broken the four year old Scottish record by almost exactly 10 seconds and yet two races were reported on in one sentence. The best was yet to come. On 7th July at the White City, in London, at the WAAA Championships Helen finished third. You would not have noticed in Scotland – the report in the Glasgow Herald gave the meeting five short paragraphs and not one Scots woman was mentioned . Maeve Kyle, Dorothy Hyman and Barbara Moore all had coverage but they were two English and one Irish women! Helen had been third in 5:02.5, the fastest time run by a Scot that year, behind J Beretta (Australia) and Madeleine Ibbotson (England). There were some reports however, one highlighting an injustice done to her by officialdom. The first report read: “HELEN CHERRY PROVES QUEEN OF SCOTS. 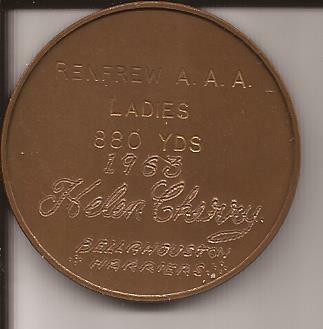 Helen Cherry of Bellahouston Harriers, 21 year old Scottish mile champion, was top performer of the seven-strong Scottish team competing in the Women’s AAA Championships at White City, London. She finished third in the mile in 5:02.5. Although way behind winner Joan Beretta of Australia, who returned 4:57, fastest in the world this year, it was a plucky run by Miss Cherry who was lying fourth at the bell. She very nearly caught Madeleine Ibbotson who finished second.” The second report read: “HELEN’S WONDER RUN CAN’T BE RECOGNISED. Heroine of the day was small, dark-haired Helen Cherry of Bellahouston Harriers, Scotland’s Mile Champion and half-mile runner up. The Ibrox girl brought the London Scots to their feet as she raced her way to third place in the mile behind England’s Mary Ibbotson and Australia’s J Beretta. It was announced that the race had been won in the fastest time in the world this year. Beretta’s time was a magnificent 4:57 – 12 seconds short of Dian (Leather) Charles’s official world best. England’s Ibbotson clocked 5:00.4 and Helen 5:02.5. Helen Cherry had scythed 14 seconds off the Scottish record but since it was raced on a ‘foreign’ track it will not be taken as a national record.”. The season of 880 yards racing seemed to have paid off with one gold and one silver at the Scottish and one bronze at the British. In the end of the year rankings, Helen was fourth in the 880 yards with 2:17.2 and first in the Mile in 5:02.5. I asked statistician Arnold Black what the real standing of Helen’s record time was and he replied that the 5:02.5 hadn’t been officially recognised but they had listed the record of 5:08.4 jointly with Helen (1963) and Georgena Craig (1966). Then in 1969 they only listed metric records. Unofficially, Helen’s time leasted until 14th June 1969 when Margaret McSherry ran 4:56.3 at Leicester. 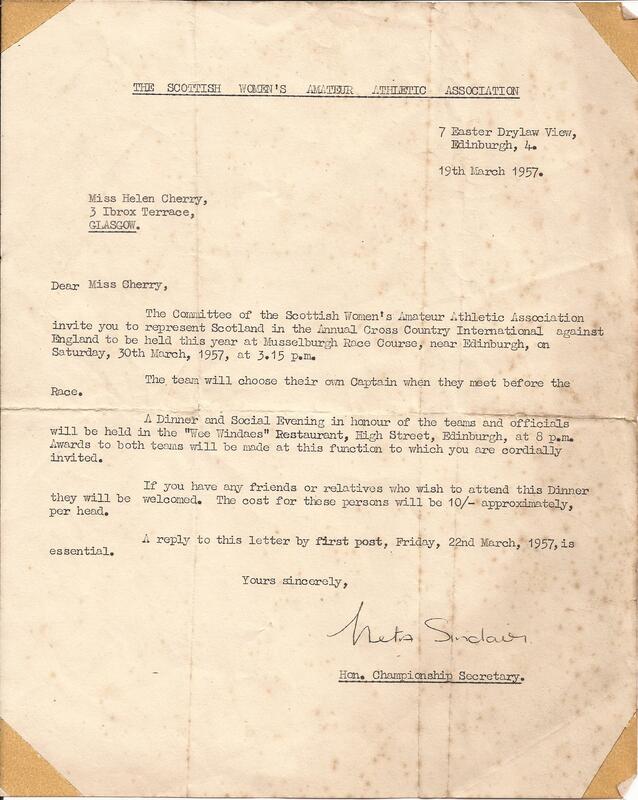 1963 produced another WAAA’s medal at the White City after she had won the SWAAA Mile and this time the Glasgow Herald did report on the meeting and actually said, after reporting that it had been held in appalling conditions, “Miss HM Cherry was Scotland’s best performer. 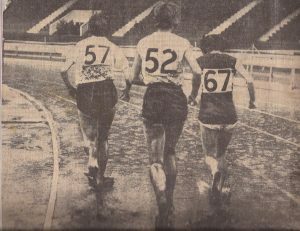 The Bellahouston Harriers girl took third place in the Mile with a time of 5:15.5.” Another report read Helen Cherry was Scotland’s heroine in the mud in the British Women’s Athletic Championships at London’s White City. The Bellahouston Harrier finished third in the Mile in 5:17.5 to win Scotland’s only medal. Courageous Helen led the field for more than halfway – but the strength-sapping track took its toll and eventually she was passed by the winner Pam Davies (Selsonia) and Madeleine Ibbotson (Longwood).” So she had been timed at 5:17.5 behind Pam Davies (5:10.8) and Madeleine Ibbotson (5:14.0). The weather clearly influenced everyone – Ibbotson had run 5:00.4 the previous year. Nevertheless, Helen was the only Scots medallist but most coverage was given to the sprinters and long jumpers with of course the obligatory photo of a long jumper! Helen had already won the West District Mile and the SWAAA Mile. At the end of the year the statistics read 880 yards, third with 2:20, Mile first with 5:08.4 plus the medals of course. The Mile at White City, 1963! 57 (J Williams) and 67 (SA Westlake) finished without their shoes. Her serious running career just stopped there although she did do several races thereafter. How good could she have been? She had won the two previous SWAAA Mile titles and medalled in the WAAA in the same two years. She was clearly the best in the country at the time. Let’s look at the statistics in tabular form – first the competitive record. Helen appeared in the national rankings every year from 1959 until her early retirement in 1963. Until she dropped down to the half mile in 1961, her best Mile time was 5:24.7 when ranked second in 1959. After 1961 her best times 5:02 in 1962 and 5:08 in 1963. There really is no way to assess how good she could have been – coming from 5:24.7 in 1959 to 5:02.5 in 1962 is quite remarkable, and the race she ran in 1962 almost catching world ranked Madeleine Ibbotson indicated competitive nerve and determination.